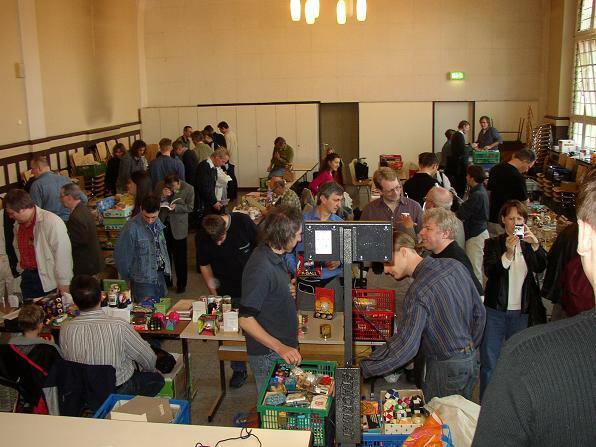 The 1st German Cube Day was held in Gütersloh, Germany on Saturday April 24, 2004. The venue was the Elly Heuss-Knapp Schule. 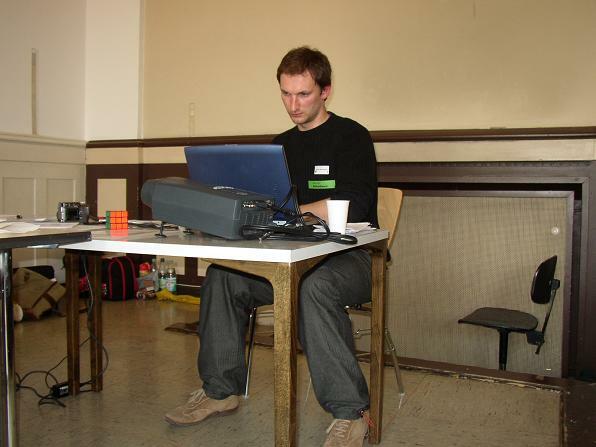 Organizer of the cube day was Martin Brockmann, who did a great job. Thank you again Martin! Other reports/pictures: Koen Heltzel, Milan Vodicka. German Cube Day attracted around 90 people from quite a number of countries, among others Germany, The Netherlands, Russia, Czech Republic, Belgium, Austria and Luxemburg. Most guests had to travel a long way. Two guests from Moscow came by train leaving on wednesday night! 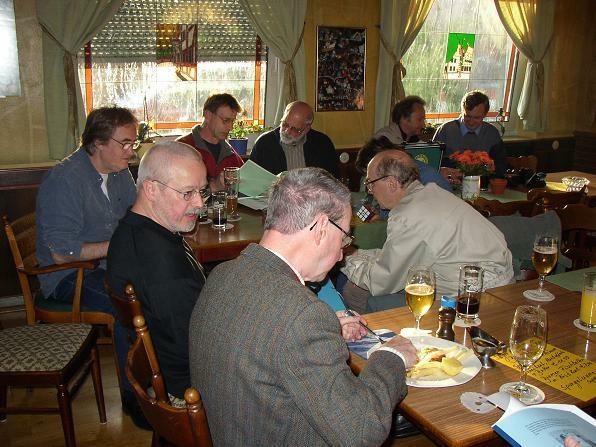 On friday night there was a gathering of people who arrived early and stayed in a hotel, in the pub "Bremer Schlüssel" in the centre of Gütersloh. It was a very nice evening with magic tricks, nice stories, showing new puzzles and books, and of course speedcubing. The cube market opened at 10am with offers on about 30 tables. 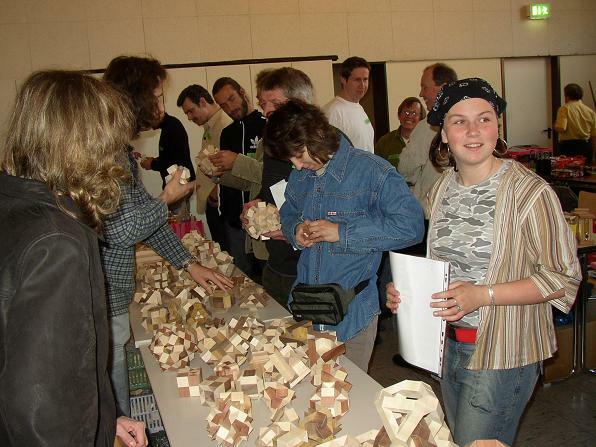 Among those was the table of Vaclav Obsivac (picture below, on the left with puzzle in his hand), with his beautifully crafted wooden puzzles. 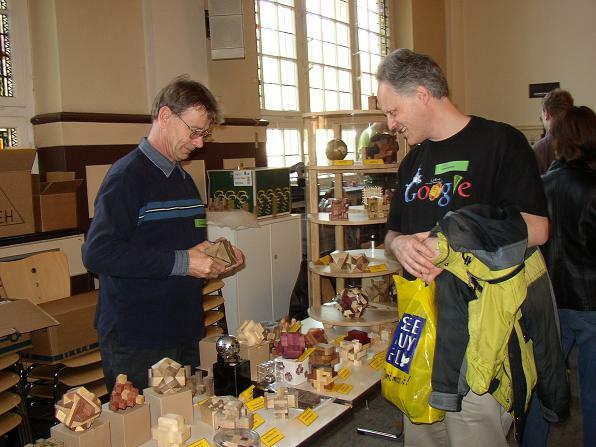 And the table of Bernhard Schweitzer (picture below, on the left), also with beautifully crafted wooden puzzles. And a table with beautiful Russian puzzles (picture below). There were two lectures: one by Bernhard Wiezorke "Schon Leibniz spielte Solitär", one by Claus Ringel "Geometry of puzzles". 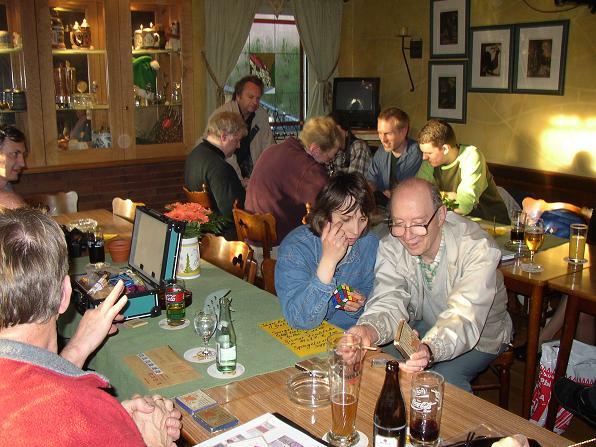 The first German Open championship took place on the stage next to the puzzle market. 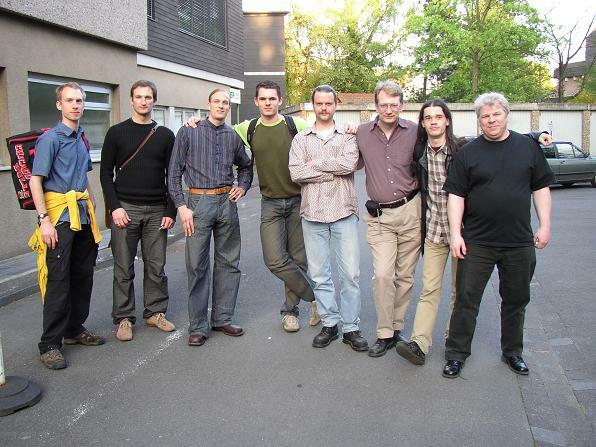 Jaap Scherphuis, Peter Jansen, Ruben Geels and Stefan Pochmann. Organizer of the German Open was Patrick Bellenbaum (picture below), who did a fantastic job in preparing and organizing the event. We cannot thank you enough Patrick! In the first round Lars Vandenbergh was already very hot, showing no nerves and setting a very good average of 17.12 seconds for 5 cubes. Ron van Bruchem was very nervous and made 4 mistakes in 5 cubes. Two great young German speedcubers Stefan Schönwälder and Michel Bechtatou (who had only been cubing for 7 months!) finished 3rd and 4th. We can expect much more from these two! In the second round Lars was even hotter, setting an excellent average of 16.35 seconds for 5 cubes. Again Ron was very nervous, talking to himself while cubing, making 6 mistakes in 5 cubes. He finished only slightly ahead of Stefan Schönwälder who set a very good average of 21.62 seconds and a best time of 17.92 seconds (probably the new German record). Fourth was Michel again, improving his first round score (see picture below). Peter Jansen set a personal best in a competition with 22.63 seconds. Ton set a personal best in a competition with 24.99 seconds. In the final things went completely different. Ron had decided to go very slow trying not to make any mistake. He made only one mistake (second cube), when he picked up the cube at the same time the judge wanted to cover it after preinspection. Lars on the other hand lost his concentration (due to noise) and unfortunately could not repeat his fantastic performances from the first two rounds. Everyone felt sorry for Lars, who deserved to win. Stefan S. and Michel were competing each other who was the fastest German cuber. Michel set a great performance finishing third and becoming German champion. Stefan had a bad start, but recovered with his last cube. See picture below from left to right: Lars, Ron, Michel and Stefan S.
Lars and Ron had a close competition with Lars winning the final. Oliver showed his great ability on the bigger cubes winning the first round. In the final it was again Lars winning, after a bad start from Oliver making some bad mistakes in the last layer. Stefan Pochmann is a true master on this puzzle with an average close to 10 seconds. He was well ahead of Lars and Ron. Jaap improved his world championship performance winning with an average of 2.44 seconds. Ron won this competition improving his best time in a competition. 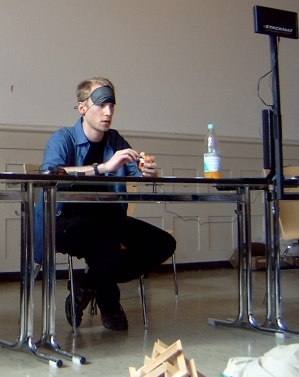 Stefan Pochmann set a fantastic performance solving blindfolded on stage. Although it was very noisy in the room, he was still able to stay concentrated. When he did his last move the crowd went crazy and he got a huge round of applause. Well done Stefan!!!! Ron also tried to solve blindfolded on stage, but after memorizing he lost control when executing his first algorithm. He continued hoping that he hadn't made a mistake but the cube still looked scrambled when he was finished. German Cube Day 2004 and German Open championship 2004 were a big success. 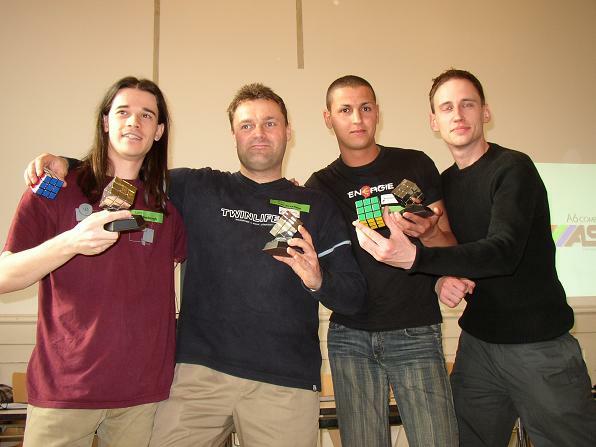 We hope to meet you all again in Amsterdam for the European Rubik's Games Championships 2004!